It easy to capture immersive video and photo footage from, well your shoulder. The wide design can evenly reduce the camera weight pressure. The storage bag can help you to store some small staff when you travel. This single 360°shoulder strap is made with elastic fibre and polycarbonate buckle. The single shoulder strap is elegant and durable. The elastic fibre enables people to adjust the perfect size for yourself and provides maximum comfort to your shoulder. Good for outdoor photography. Easy to use. 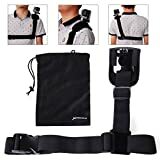 It is equipped with connection plate that fits for mounting your Gopro camera on your shoulder. It’s suitable for GoPro Hero Camera 1 2 3 3+. Note: This item is not manufactured by GoPro. It is 3rd party manufacture to compatible with GoPro. This entry was posted in Discount Photography and tagged Adapter, Belt, GoPro, Hero, Mount, OS221, Shoulder, Storage, W/Tripod, XCSOURCE® by Ball Photo. Bookmark the permalink.